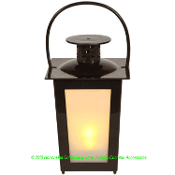 Spooky Halloween BLACK and WHITE FROSTED Flicker LED lantern will help light your way! Plastic lantern in classic shape coach style is *Battery-operated (*Included FREE) with an on/off switch and have a plastic handle at the top. Use to cast a warm and inviting glow at events, haunted house, Halloween costume parties... great for any pirate themed outdoor or indoor event. Also makes an adorable birthday party favor. Approx 5-inch (12.5cm) Tall, total 6.5-inch (16.25cm) with carry handle extended. Requires 1- 3V CR2032 button cell battery, included FREE. For garden party atmosphere, a little gift favor for guests, or themed lighting for your home bar, this Black and White Frosted Party Lantern glows softly for that perfect eerie ambiance! Cute kitsch fun party lantern is glossy black and lit by a white flickering LED to shine light from the frosted white paneled center. Easy carry swivel handle to carry or hang around your home.